"Patricia Marie Gaudet, Westbrook College, Class of 1978"
Westbrook College student Patricia Marie Gaudet, Class of 1978, was a Dental Hygiene major and lived in Linnell Hall. 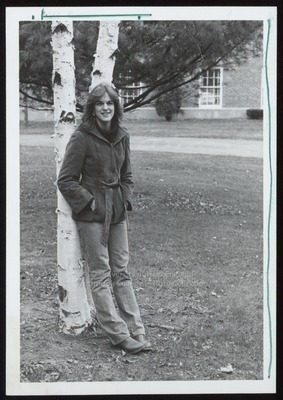 For her senior class candid photo, which appeared in the 1978 Tower Yearbook, she wore jeans and a dark turtle neck sweater under a hooded, suede jacket with a belt tied at the waist. Her dark hair was cut in a long shag and feathered back from her face. Patricia leans against the trunks of two white birch trees on the campus Green.